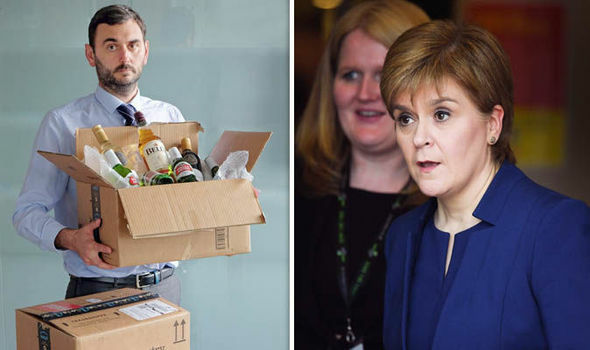 On the day the new legislation came into force north of the Border, we were able to purchase two boxes of drink for considerably less than it would now cost in Scotland. Our order from online shopping giant Amazon was dispatched from Doncaster in South Yorkshire, therefore avoiding the minimum price of 50p per unit of alcohol. Even with shipping costs of almost £5, we were able to save almost £4 on a total order of just over £45 – a saving of almost 10 per cent. Although the controversial policy is designed to crack down on drinks such as superstrength cider and lager, it also drives up the price of more mainstream choices. Our order included bestsellers Stella Artois lager, Strongbow cider and Bell’s whisky, as well as some perfectly palatable red and white plonk. Scottish Conservative public health spokesman Annie Wells said: “It’s right we give minimum pricing a try to tackle Scotland’s damaging and deep-rooted relationship with alcohol. But it seems, just days after its introduction, gaping loopholes are in evidence. SNP’s new minimum alcohol pricing law has HUGE Amazon ‘loophole’ | UK | News | Express.co.uk.